The first Swallow-tailed Kites have begun the 5,000-mile return journey from their South American winter ranges to their breeding grounds in the southeastern U.S. The kites have spent the last month on what is considered the world’s largest tropical wetland, the Pantanal. The floodplain ecosystem is characterized by seasonal wet and dry periods, and at this time in early February, the area is just coming out of the wettest, warmest month of the year. Wet, warm, and buggy. If you live in the southeastern U.S., must sound very familiar to you! In fact, the Swallow-tailed Kites’ South American home is much like their North American home, minus about 18 million humans. 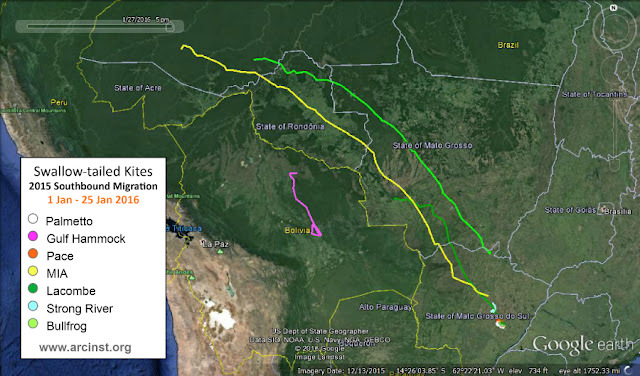 Movements of 7 satellite-GPS tracked Swallow-tailed Kites from 1 Jan to 25 Jan 2016. At this time, ARCI is tracking just seven birds with Satellite-GPS transmitters. Sadly, we must report that PearlMS and Day died during the southbound leg of their migration. Thanks to a generous donation from Ken Gunn on behalf of Southeast Volusia Audubon Society, we have arranged for a Brazilian colleague and former ARCI employee, Emily Toriani, to investigate the agricultural area from which we received Day’s last GPS locations. This is part of the broader region where, after we lost the signals of three tagged Swallow-tailed Kites, ARCI’s Dr. Audrey Washburn determined that rapidly expanding industrial farms growing soybeans and sugar cane apply chemicals known to harm wildlife. Emily begins her fieldwork in five days. We will update you soon on what we learn. Four of the seven remaining tracked kites have started north. The earliest to leave, on 10 January, was MIA, a male Swallow-tailed Kite tagged in Miami, Florida. This is the fourth year in which MIA has been the first to depart the winter range, and he is currently in the Brazilian state of Acre. Bullfrog, a male tagged in the Tampa Bay area, is in second place, about 250 miles behind MIA. Lacombe, tagged in Louisiana by ARCI’s long-term collaborator Dr. Jennifer Coulson, started north on 21 January and is in Mato Grosso, Brazil. The only kite to winter in Bolivia, Gulf Hammock, is also on the move. She left on 23 January and is 70 miles south of the State of Rondonia, Brazil. Palmetto, Pace, and Strong River remain together on their common wintering grounds in southern Mato Grosso do Sul. This area is very close to where MIA and Bullfrog wintered. It is fascinating that birds tagged near their nests across the Southeast - in Mississippi, South Carolina, and throughout Florida - all winter in this same part of Brazil, a narrow area no longer than peninsular Florida. We want to give a special thanks to Subaru of Gainesville for their continued commitment to conservation by helping us share the story of these special birds. Their sponsorship of the Swallow-tailed Kite blog gives us the means to translate data-points to narrative, reinforcing the connection between human hearts and an extraordinarily inspiring bird. At ARCI, we believe this is the key to saving our vanishing wildlife.